Playing electric guitar left-handed makes for a limited choice among production models – especially on a limited budget. I wanted something like an SG, and that meant the Epiphone G-400 for my price range. But then I’d be buying pickups and tuners that I’d only want to replace ASAP; wasn’t there an affordable guitar that might not need immediate upgrading? 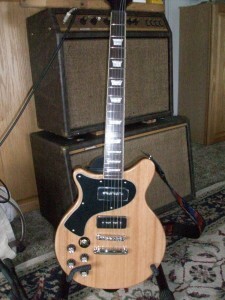 It’s also about $100 cheaper than the Epi G-400, and I liked the natural look, so I decided to go with the Agile. Besides, I really wanted to see how Rondo’s quality was — they offer a lot of left-handed models, and I’d like to support that. The (left-handed) Agile arrived well-packed and in good condition.It was actually the left-handed model I had ordered, so Rondo had already surpassed TradeTang for filling my order correctly. On the other hand, they also had the same problems: the tone pots don’t really work except for the last 5%, when they suddenly kill all the treble — no gradual treble reduction. Also both volume knobs act as master for both pickups, so you can’t set them at different volumes from each other. Since this eliminates any sensible reason for having two volume knobs, I see this as faulty wiring [the Chinese guitar had this exact defect], but fixing it should be a simple resoldering job. Likewise the tone pots, if not replacing them with better ones. the sound: P-90s deliver full, bright sound, and are wired so that using both together knocks out a great deal of the hum/noise that single-coils are famous for. it’s much better-looking than the Web site photo, which just looks like stained wood. The actual finish looks more like blond wood with a thick clear lacquering; you could use this as a table and not worry about leaving marks on it. appearance is reminiscentt of Rickenbacker or even Brian May’s Red Special. It is distinctly heavier than the Epiphone G-400. It feels a little thick in the hand, in a way that reminds me of a cheap “first guitar” …. probably not helped by a slight bow in the neck. The G-400 is also a bit neck-heavy because the body is so light. The AD-2300, on the other hand, matches the Strat for weight and still wants to droop. A leather strap helps to reduce this, but it’s raising a question in my mind as to why I have to accommodate this guitar from drooping. I’m used to this from a 12-string, or when playing asymmetrical righthand guitars upside down, but I expect a lefty 6-string guitar to sit up in playing position without being helped. For me, that weighty imbalance may well prove to be the deal-breaker — I wanted something with less shoulder-fatigue than the Strat for those long-might jams. I’ll bring this to band night on Friday & see how it feels in the third straight hour. But truthfully, I expect I’ll be sending this back & getting a G-400 with lesser pickups & cheaper tuners. The one bedrock necessity in an electric guitar is the body & neck; all else can be changed.